Whether it is a small room or guest room; the big size bed or a large sofa do not always fit easily. These Daybeds can be used in any room. However, the contemporary daybeds have their own attractive design. 9. Kansey Daybed with Trundle by Williams Import Co. 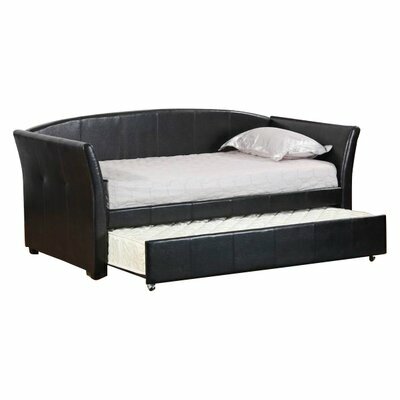 So How to Compare Daybed with Similar Beds? Is a Daybed an Important Piece of Furniture? 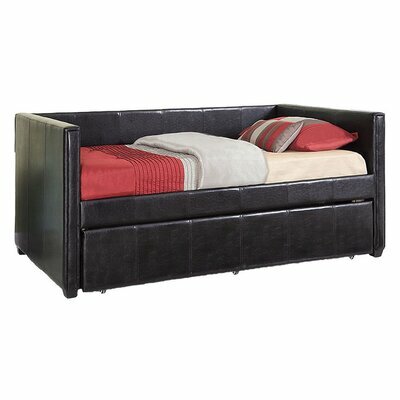 Burlington Trundle Daybed features cosmopolitan style. This daybed is smartly tailored and upholstered in grey linen that radiates warmth. Burlington daybed with seating capacity for three people can be used as a sofa in daytime. Roll out the trundle and transform this gorgeous daybed in to extra sleep space to accommodate your guests with style and comfort. Includes arms and roll-out trundle. Trundle is not attached to the daybed frame. Requires assembly and installation. Tools required for assembly are included. Maximum weight capacity for the daybed: 300 lbs (including mattress). Maximum weight capacity for the trundle bed: 300 lbs (including mattress). 6 inches high standard twin sized mattress fits in perfectly. Birch Lane Hampton Daybed is easily adaptable to a number of styles. Transform the stunning Hampton Daybed from country-casual style to comfortable sleepover space in the blink of an eye. The roll-out trundle offers extra sleeping or storage space as per your requirement. Crafted from MDF, Chinese birch and veneers, this daybed features a sturdy and long lasting frame. Antiqued white finish with finials make this day bed look stylish. Headboard style back and arms are both practical and elegant. Constructed from MDF, Chinese birch and veneers. Has seating capacity for three people. Three knobs to pull out the trundle bed. Trundle bed rolls out straight and does not raise up to the level of daybed. Finished back for a refined look. 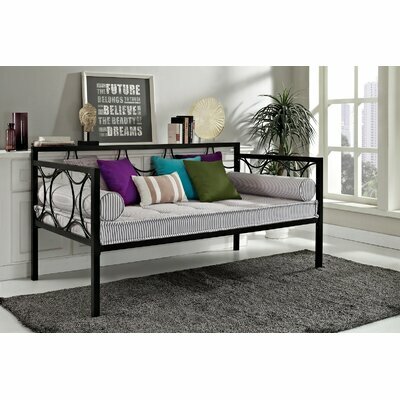 Daybed has slat support system and does not require link springs. For safety purpose, screw caps are not included as kids and pets may ingest or choke on them. Maximum weight capacity for the daybed: 200 lbs. Maximum weight capacity for the trundle bed: 200 lbs. Twin size mattress fits both daybed and trundle bed. Product Care: Use a dry and clean cloth for dusting. Grace your room with the clean and crisp tailored look and squared off silhouette of this lovely Noyes Upholstered Bed. Low profile headboard, footboard and tapered legs enhance the overall charm of this daybed. The frame is padded generously with foam and upholstered in PVC fabric. The headboard can be used in various configurations. Just attach the headboard to the side of the daybed where you want it. This versatile corner daybed will adorn your room. Available in two graceful colors including Black and Brown. 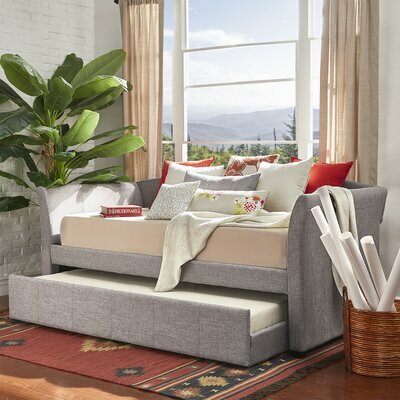 This is a versatile corner daybed. Includes headboard which can be configured to either corner. Headboard is upholstered and tufted. Upholstery material is PVC fabric. Slats included to support mattress. This daybed requires a box spring. Standard full sized mattress is compatible with this daybed. Maximum weight limit: 450 lbs. Lafferty Daybed is apt for contemporary room décor. Crafted out of mahogany solids and engineered wood, this daybed is robust and long lasting. Crisp white finish and small ball finials accentuate the overall look. Subtle design of headboard and arms add appeal to the daybed. 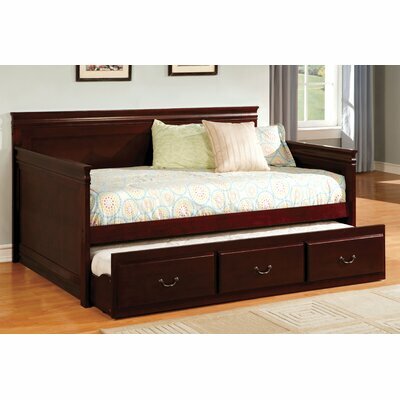 This elegant Lafferty Daybed comes with two drawers. You can store your infrequently used items in these spacious storage drawers. Constructed from mahogany solids and engineered wood. Four knobs on recessed drawer fronts. Knobs have brushed nickel finish. Mattress, pillows and bed coverings are not included. Use a standard twin size mattress with this daybed. Solid wooden slats included to support the mattress. 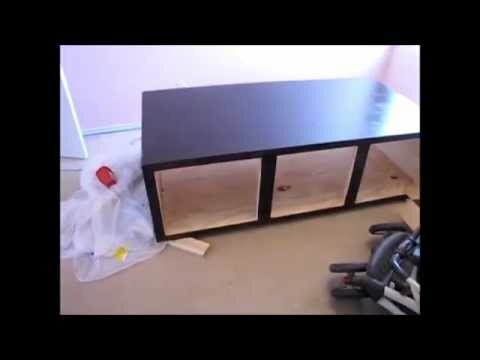 Easy to assemble with the help of Phillips screwdriver. Product Care: Clean it with the damp cloth. The Cromkill Daybed will bring charm to your contemporary fashioned room. Made out of sturdy wood and metal, this daybed is sturdy and long-wearing. Four solid hardwood posts not only add style but also provide support to ensure that the daybed stays steady. Polished hammered pewter and rich espresso finish enhances the overall appeal of this daybed. Cromkill Daybed is ideal for your office or guest room. Use of non-toxic materials in construction of this daybed makes it perfectly safe for your family and pets. There are a number of optional accessories available with Cromkill Daybed for you. You can pick the ones that suit your requirements. Manufactured from strong and durable wood and metal. Non-toxic materials make this daybed safe for your family. Finish: Polished hammered pewter and Espresso finish. Finial posts are made of solid tropical wood with metal on sides and back. This daybed includes one Euro deck and one pop-up trundle bed. Wooden Euro slats go across the bed to provide optimum support to your mattress. Does not require box spring. Convertible to trundle but requires link spring. Very easy to assemble with the help of screwdriver. Accommodates a twin size mattress. Mattress is not included with the daybed. Add a splash of color with an extra bit of function to your bedroom with the stunning Suzanna Daybed with Trundle. Generously padded with foam and upholstered in vinyl fabric to offer you maximum comfort with great style. The black color gives this daybed a warm appeal. Roll out the trundle when you need an extra sleepover center for guests. Daybed frame is fully upholstered in vinyl fabric. Headboard and footboard are thickly padded with foam. Comes with a roll-out trundle. Use twin size mattress for both bed and trundle. 8 inches high mattress is recommended for the trundle. Wooden slats included to support the mattress. The Meyer Daybed with Trundle by Woodbridge Home Designs will look great in any modern bedroom setting. Non-toxic engineered wood construction makes this daybed robust, durable and perfectly safe for your lovely kids and pets. 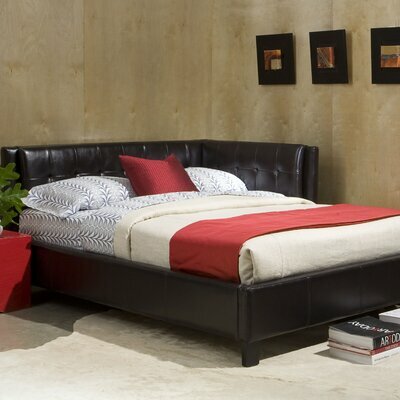 The daybed frame is fully upholstered in rich and dark brown bi-cast vinyl which adds charm to its overall look. Meyer Daybed comes with a trundle that gives space for an extra bed. Made out of Manufactured wood. Thickly padded with good quality foam. This daybed includes a pull-out trundle. The trundle cannot be separated or removed from the daybed. It is easy to assemble using screwdriver and wrench. Requires link spring (not included). 8 inch high mattress in recommended. Product Care: Use a clean and damp cloth to clean this daybed. The gorgeous Anastasios Daybed will create a welcoming and comfortable space for your family and guests. This twin size daybed offers sufficient seating area for three and sleeping corner for one. Square tubes with circular motifs accentuate the contemporary look of this elegant daybed. With its black finish and lovely design, the Anastasios Daybed is apt for any modern room décor. The Anastasios Daybed features a simple and tailored look that is sure to exude warm vibes of hospitality around your room. Accented with circular motif details. This daybed can also be used as settee. Seating capacity for three people. Mattress is not included (sold separately). Bring practicality and style statement to you home with Williams Import Co. Kansey Daybed with Trundle. This elegant daybed will serve as a comfortable sofa by day and as a cosy bed by night. The Kansey Daybed features a trundle that moves on wheels and makes it easy to roll it out. Solid hardwood construction renders strength and durability to the daybed. 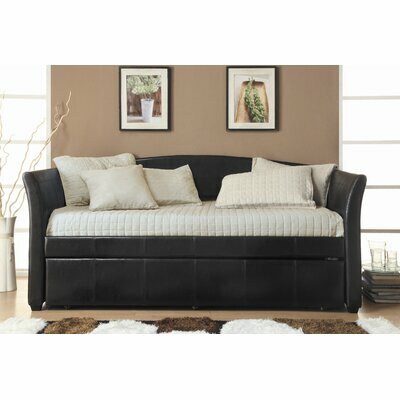 Espresso finish and leatherette upholstery adds graceful charm to the daybed. This contemporary daybed is a must have! Generously padded with foam for maximum comfort. Trundle slides freely on wheels. Trundle can be removed and used separately. Daybed has bench styled back which is opened at the base. Maximum weight limit for the daybed: 450 lbs. Maximum weight capacity for the trundle: 250 lbs. This daybed is easy to assemble. Accommodates regular size twin mattress. For trundle, height of the mattress should not increase more than 6 inches. Cooper Daybed with Trundle by Hokku Designs is crafted skillfully get most of your space. It features a compact profile with a twin size trundle under the bed. Cooper Daybed present comfortable lounge space by day and warm and cozy sleep corner by night. Wheels under the trundle make it easy to pull out. Decorative metal pulls to trundle front. Slat kit included to support your mattress. Maximum weight limit for the daybed: 250 lbs. Maximum weight limit for the trundle bed: 150 lbs. Twin size mattress is compatible. For trundle, 8 inch high mattress in recommended. Mattress is not included with this daybed. Product Care: Use a wood cleaner; avoid using harsh chemicals. If you have a small room where a bed isn’t easily accommodated, a daybed can be the right thing to use which doesn’t only saves the space, it also makes your room look beautiful. Generally it can also be ideal for guests even in big houses as it has a different look compared to a bed or a regular sofa. Moreover, a daybed can also be used as a sofa, saving you tons of space and fulfilling your seating requirements. It can be added to a TV lounge, because of the size of a daybed, your guests would enjoy watching TV more when you have an appropriate size of the TV stand. How about outdoors? If you have park outside your house you can simply place your daybed there and make evening with your guests more pleasant. Mostly there are two types of a daybed, a regular daybed and daybed with trundle. The major difference in both is the trundle gives extra sleeping space as it is an additional bed hidden under the daybed which can be used by simply sliding from the daybed. Daybeds mostly measure same as twin beds. The common size is somewhere between 39 and 75 inches width and length. Another size for daybeds is 90×200, which is also common to find. As a daybed requires a twin mattress, it can be good for a single person to sleep with comfort on it. If it has trundle bed under it, that is then good for two people. Along with its convenience the daybed can be found in different designs giving you various features. Some daybeds offer you with drawers beneath or the shelves on the top to place your books or other decorative items. How about a canopy daybed? There are several DIY methods which can be used to add canopy to your daybed. The daybed can also be used for toddlers, simply by turning it facing against the wall. Here it is explained on this site. Place your daybed by the window to get natural air and make your room look beautiful. If your daybed is constructed by metal, you can also find some daybed back pillows which make it comfortable for you. When it comes to dressing a daybed, if you don’t find yourself creative enough to dress it, you can still find many videos and DIY tutorials, which would help in dressing your daybed. 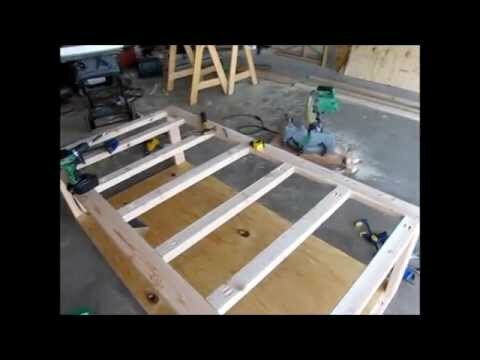 If you have some extra time and can find right tools you can build your own daybed. Depending on type of your daybed, the different tools would be needed. These tools may include: Table saw, miter saw, drywall screws, paint, twin mattress, 4 bun feet and 4 metal brackets. There are instructions on this site on how to do it yourself. A sleeper sofa looks like a regular sofa. So, what makes it a bed is its mattress which usually gets folded into its interior, otherwise someone can’t easily judge it being a sleeper sofa. On the price point a sleeper sofa tends to be more expensive, for this reason daybeds are good on a budget. Even though both daybed and futon have similar features, these are different by several aspects. As the name suggests, the daybed is more like a bed while futon looks more like to sofa that converts into a bed depending on the use. Well, I can understand it doesn’t look like more of a difference but there are still several things different in each such as design and structure. Both have space saving capabilities and are used for seating space and sleeping. Though sofa beds have a specific style and it is difficult to tell if it is a bed when it is placed as a sofa till you bring it together. Another good thing about sofa beds is these convert to a full bed giving sleeping space to more than one person. Whereas a daybed still has its own beauty, it can whether look like a bed and a sofa at the same time because of its size. Daybeds also offer a number of choices for your requirements, such as with trundle, no trundle and storage. When you are living alone, trundle would not be your choice. Instead a daybed with storage or drawers can be more suitable for you. The storage is great for your clothes so you do not need an extra armoire or cupboards. So it saves even more space by offering you in beautiful drawers. The main feature of the daybed which makes it popular is daybed having a trundle feature. However, it is not something new. There are trundle beds which offer a sliding bed beneath. The only difference is, these are regular twin beds with an extra hidden bed for your guests or sleepovers. But, if you look at both, you can see a daybed with trundle looks attractive because it makes it even more unique piece of furniture. Almost in every home, we can see the common furniture such as sofas, beds, chairs and dining tables etc. A daybed on the other hand serves multiple purposes. It resembles to an extra-large (in height) sofa, yet it is not a sofa. However, it can be used as a sofa or couch and can also be used as a bed because of its length. The same daybed can also be used in a guest room where your guests would find it an impressive piece of furniture for a delightful conversation. May be the inventor of the daybed didn’t know how useful would it become for people. As you wouldn’t possibly ignore the choices you can have with a daybed. But if you are new to it; you may still want to know about it, such as its components and materials. The wooden frame has been used for centuries, and the best thing about the material is; it is available in different types. Such as it is your choice what wooden material you for example: Beech wood, oak, pine, walnut and you name it. Wooden daybeds generally look like sofas. For this reason, these are ideal for guest rooms as a single daybed can accommodate more people than a regular sofa due to its length. Not only that, your guests can also sit with comfort as it has wider sitting space. Wooden frame gives a classical look to a daybed but it also depends on its style and design. Let’s talk about some of the best quality wood materials used in a daybed. When it comes to traditional furniture, oak is popular for its hardwood. It gives a unique look to your daybed. Oak keeps it durable and long lasting. It is so much sturdy that people make ship flooring with it. So, you can imagine how great it would be for a daybed which doesn’t have to carry so much weight. The Oak wood is expensive as compared to many different woods. The reason behind this can be the slow growth of oak tree and its wood also becomes stronger. Oak has been used in furniture for hundreds of years. Pine usually is a light color wood. The pine daybed frame is light-weight compared to oak, making it easy for you to move the daybed around. Being shock resistant, a daybed frame made of pine prevents any damage. However, there are some downsides to it too such as it wears out by time quickly than oak. When a sharp object hits it, it can be easily scratched and marks can be visible on it. An alternative to oak, birch and maple frames is solid wood daybed frame if you are looking for a frame on a budget. It is made by using species of hardwoods like oak and birch but it is the low cost alternative for you. Wrought iron made of iron with very small percent of silicon, phosphorus, sulfur and aluminum oxides. A daybed frame made of wrought iron makes the daybed strong because wrought iron has high durability compared to cast iron. On the other hand, when it comes to iron works; it is flexible than the cast iron. Moreover, it is widely used in making different items such as chains, agricultural items and nails etc. 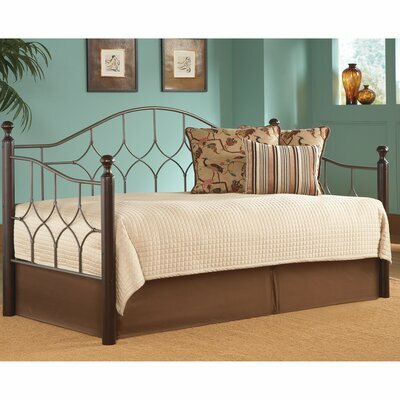 So, you know by now how durable a wrought iron daybed frame would be. The downside of wrought iron is it can rust easily if it doesn’t get waterproofed. If you looking for a daybed for outdoors such as lawn or garden, the cast iron daybed frame would be suitable for it. The reason is; cast iron is suitable for outdoors because it has hardness and heaviness. Steel is much heavier form of metal for a daybed frame. However, it is durable and weather resistant and stainless; if you add your daybed as patio furniture it can still be effective. With proper care you can keep it in good shape for long-term. But because it is heavy, it might make it difficult to move around by a single person. If it is placed outdoors it is better to cover it as its temperature changes with weather. The downside of a steel frame is, it is expensive compared to most metals because of its quality and rust-free properties. The brass is coming back and it is becoming a new trend after long years of using stainless steel furniture. People are moving towards yellow metals. Similarly, it is also becoming popular in daybed frames. The golden shades of brass are making household furniture more attractive. An upholstered frame gives a new look to the daybed. If you are not into wooden furniture designs or floral metal frames, the upholstered would be the right frame for your room décor. The best thing in using an upholstered frame is; you do not have to find extra covers or cushions to match your room furniture, but you can find the right upholstered frame color to match your room décor such as: curtains or drapes, the color of carpet and color of sofas etc. Having a luxurious look, daybed never forgets to surprise your guests. This huge sofa-like furniture can easily match with most items in the room décor. The reason here is; daybed is a unique piece of furniture and not everyone uses it. Keeping it in your guest room makes it special for your guests. Placing daybed in kids’ room makes the room playful for children. There are endless possibilities and ways the daybed can be used. A daybed with trundle can help two kids sleep and then the trundle slides back to save space in the room. If your kid is 2 years or less, you can simply add a board on front of daybed and use it as your kid’s crib. If you don’t have boards available you can simple move the daybed facing wall. Daybed would also be an ideal piece of furniture in your sunroom when you are in a mood for reading or getting warm in winter sunlight on a cozy sofa-like bed. Its long length would give you a choice between sitting and reading or just laying down. Daybeds are not like regular indoor furniture to be used for indoors only, but these are popular for outdoors. How about enjoying some fresh air in your garden on a comfortable bed? A large round daybed with canopy can serve this purpose by giving you comfort and sunshade while you enjoy healthiest fragrance of flowers. Now let’s talk about space saving. Of course, in a bedroom you have to use a bed. But if you have a small room, a daybed with trundle would be something to consider. Another good reason for having a daybed in your bedroom is; if you are sharing a room with someone, and don’t want to sleep together on a regular bed. A trundle bed solves that problem by its slide out or pop out trundle. Now, both of you have a separate sleeping area of your own within one daybed.